This Sale Set A New Record for Highest Sold Price Per SqFt in the Glenmore Complex! Contemporary Renovations Top to Bottom! Move in Ready! Exceptionally located apartment with contemporary renovations top to bottom! Move in ready! 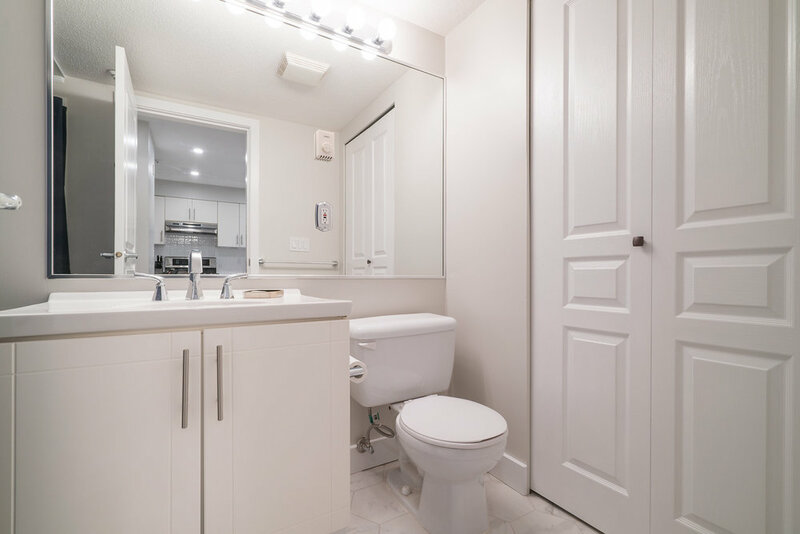 New high-quality marble porcelain tile, new hardwood flooring and moulding, new pot lights and feature wall, new kitchen appliances, new quartz countertops, updated bathroom and freshly painted throughout! Enjoy a private tranquil forest view from a generously sized balcony (BBQs allowed). 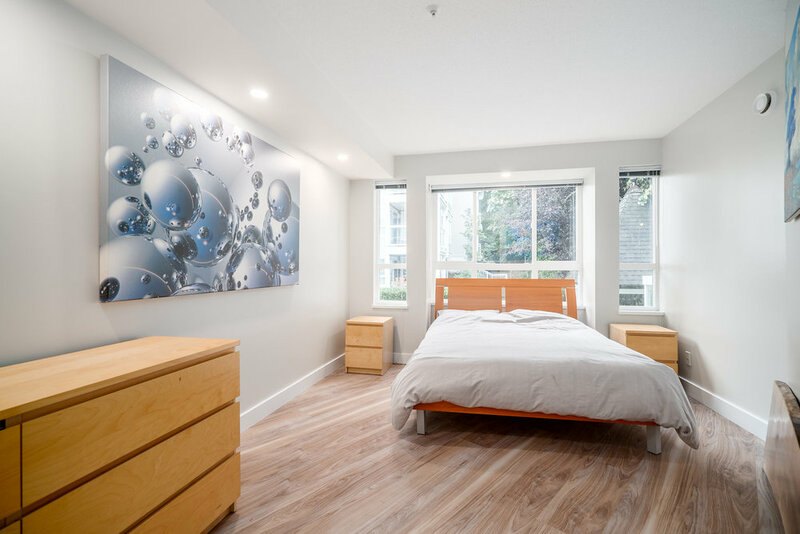 Amenities include a car wash bay, bike room, excellent fitness centre, and lots of no-hassle visitor parking. This condo is a commuters’ dream location! Less than a 10min walk to the Evergreen Line (Moody Centre, which takes 44min to Waterfront Station) and West Coast Express (which takes just 25min to Waterfront). Much of this wonderful neighbourhood is being redeveloped, with plans for even more green spaces, paths, and other developments in the works. Also, just up the hill from Rocky Point Park and countless great breweries and shops! The Glenmore complex is comprised of two buildings (3033 and 3099 Terravista Pl). The forest view can be seen from both the living room and bedroom. This unit features a portion of courtyard view, though not so much that it is intrusive. 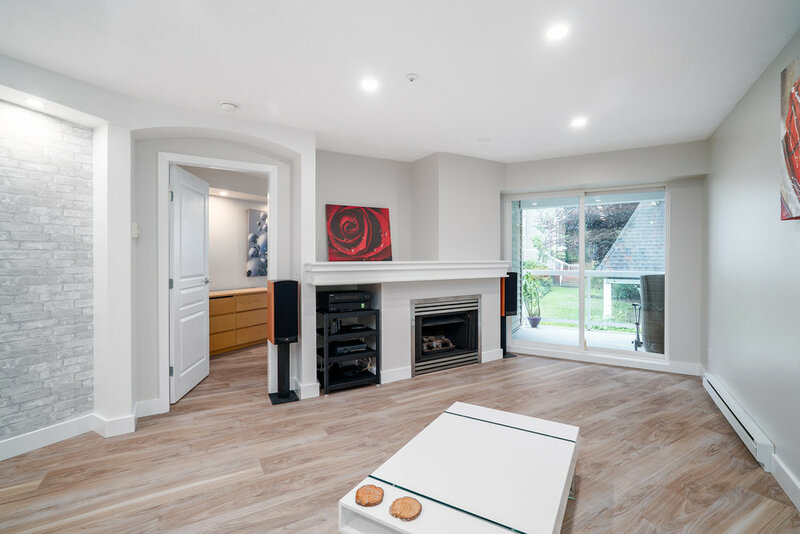 Spacious Living Room with New High Quality Hardwood, Feature Wall, Gas Fireplace, & New Pot Lights Throughout - Fantastic Layout for Entertaining! Large master bedroom that can easily fit a king sized bed! This bedroom also has a wonderful walk in closet. Beautiful views from this room as well! 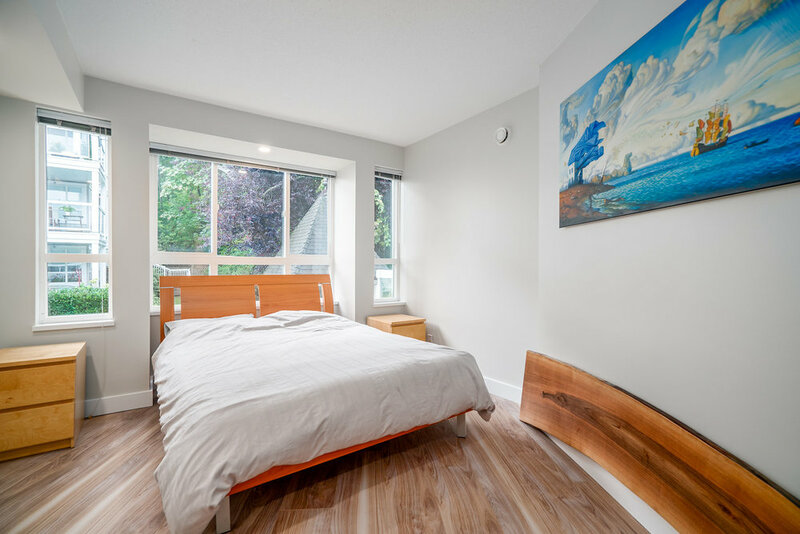 The seller has installed pot lights above the bed and on the side wall, which gives this condo much improved lighting versus all other units in the building. Contingency reserve fund currently is as $292,710.44 as of the July 3, 2018. This excellent strata is very much on top of all engineering reports and other building maintenance. The Form B lists current availability for 3 more units in the allowed rental pool. Aerial view of the Glenmore - 3099 Terravista Pl. on the left, and 3033 Terravista Pl. on the right. Outside of the Glenmore - 3099 Terravista Pl. on the left, 3033 Terravista Pl. on the right. This is the exercise & recreation room at the Glenmore, this gym recently got a bunch of new equipment! Other amenities of the building include a bike room, garden/common area, a small library in the lobby, a car wash bay and lots of easily accessible visitor parking. Less than a 10min walk to the Evergreen Line (Moody Centre, which takes 44min to Waterfront Station) and West Coast Express (which takes just 25min to Waterfront). Just up the hill from a neighbourhood park, as well as Rocky Point Park. Walking distance to Newport Village, and many close shops and dinner locations. This wonderful neighbourhood park is just down the hill from 3099 Terravista. The very large and beautiful, Rocky Point Park is also less than a 10-minute walk away! In the summer months, Rocky Point Park is home to many events and is a great place for the family! Rocky Point Park is home to many events in the summer months! Parking: 1 spots, under-building parkade & lots of easily accessible visitor parking. Maintenance Fee: $229.87 (2018 from the Form B). Management Company Name: Bayside Property Services Ltd. Spacious feel thanks to 9-foot high ceilings and large windows. Open concept kitchen with granite countertops, nice cabinets, and stainless appliances. Privacy from the courtyard thanks to a smart landscape design, where you can enjoy your large patio perfect for BBQing and hosting! Everything is right about this well kept complex with beautiful courtyards, expansive exercise room, games room including a pool table, and events/meeting room. Condo comes with one of the best parking spots in the complex, and there's also lots of visitor parking. Additionally, you're just steps from the Evergreen line, many breweries, and great shops.